The 8000FG is available as pump fed and gravity fed. It is a high quality, free-standing, fibreglass, three bay, filter designed to improve your fish’s environment. Its “state-of-the art” multi chamber ensures maximum filtration with the minimum of maintenance. 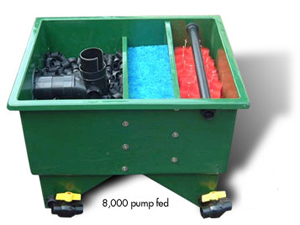 The unit is suitable for fish ponds of up to 8000 litres and a maximum flow rate of 6000 litres ph. However, with lighter stocking densities or in fish free ponds the 8000 FG will comfortably cope with much larger volumes. Complete with multi spray bar (pump fed), filter brushes, Japanese matting and flocor. Its clever design enables it to fit through a standard 30" domestic door opening (if required) so it can be transported through the house for those properties where there is no side or rear access. Optional matching vortex (VF1) available for gravity fed model.